Abiding and adorable; your luggage case is the epitome of stylish servility- ‘a delightful butler of many colors’. It listens, cares and looks unpretentiously charming while giving in to our persistent tugging and pulling. You may sashay down the airport lounge or hop and skip on foreign cobbled streets in clothes sewed to evoke envy; but if your luggage hasn’t been chosen carefully, it becomes the only amateur brushstroke in a masterpiece. Your choice of luggage case - from a suitcase, duffel bag, or a tote - can make or break your prospects of becoming travel royalty. Each vacation, every travel, calls for its special luggage. And so does the luggage case. YOUR LUGGAGE & YOU | To make things easier, we offer you the IFM Style Guide to help you buy the luggage that shares your personality and caters to your needs. For the ‘more is less’ | Some of us like to carry our world with us when we travel. Literally. For them, we have the Delsey Luggage Helium carry-on trolley case. At 19”, it can hold enough for a 5-day trip. It’s also lightweight, which makes it fuss-free. For the ‘style conscious’ | Darling diva, make a lavish statement in the ergonomically superior Samsonite 21” Spinner. It’s stylish, slick and spacious, all at the same time. For the ‘family first’ | If you seek family support every time you travel, then the American Tourister Luggage Fieldbrook Set is just for you. WHICH BESPOKE LUGGAGE SPEAKS BEST FOR YOU | One can’t learn to be classy. It’s a trait few are blessed with. For the rarest among rare, we present a veritable choice of luggage to pick from. The uber chic Louis Vuitton luggage set. It doesn’t come better than this. The simply Vivienne luggage case! Class-apart luxury that is most definitely a privilege. Trust Diane Von Furstenberg; the diva among designers for luggage that’s oomphy and simply wow! START A COUTURE LUGGAGE COLLECTION | You are unique. And so are your choices. In a world that’s running amok as replicas of one another, a discerning individual must take the next step to patent their exclusivity. One way of doing so is by starting your own couture luggage collection. A luggage that bears the imprint of your class is a must-have for the crème-de-la-crème of the society. Louis Vuitton comes to the rescue, yet again. Its bespoke collection which takes into consideration your distinct requirement and taste will design a luggage case ‘just for you’ while ensuring that no duplicates ever take the sheen off your glamour. Visit their store in India or simply browse online to know more. 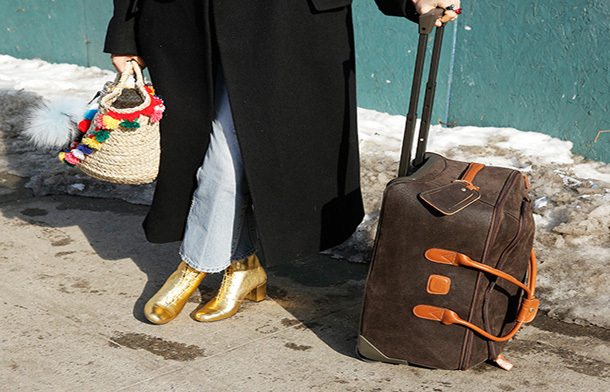 QUIRK UP YOUR LUGGAGE | Travel is always fun and with these interesting ideas and your luggage case will not be far behind! Give that staid old boring luggage tag the proverbial lift. Inventivetravelware.com offers myriad options to choose from. If you are someone who prefers the less obvious, you must dive head-first into this vast ocean of strangely wonderful luggage bags! Luggage huggers to cutesy locks, you can give wings to your travel fancy right here. Dear traveler, it’s time to jet, set and go!